Arthroscopy is commonly known as keyhole surgery which allows the surgeon to view the inside of your joint, providing a more accurate way to diagnose and treat certain conditions. A small camera is inserted into the knee and the images are relayed to a television screen. Specialist instruments are introduced into the joint through small incisions (less than 1cm). Using these instruments a surgeon can perform a number of procedures. These include washing out fluid or tissue debris, removing or reattaching loose fragments, repairing or removing torn cartilage. This is a minor surgical technique normally carried out under a general anaesthetic. An arthroscopy may be done to investigate symptoms (diagnostic) such as pain, swelling, or instability of a joint. It may show damage to cartilage or ligaments within a joint, fragments of bone or cartilage which have broken off (‘loose bodies’), or signs of arthritis. The menisci are 2 semi- circular structures of soft fibro-cartilage which act as shock absorbers within the joint. They are often injured by twisting activities. If you have a tear in the meniscus the torn section is ‘trimmed’ back to healthy stable meniscus. Often,it is possible to repair the torn cartilage, although this is most common in the young adult or child. The Cruciate ligaments are 2 strong ligaments, the anterior and the posterior, which provide stability of the knee on twisting and pivoting activities. They are often injured in contact sports and skiing. Arthroscopy allows a clear view and physical inspection of the Cruciate ligaments and gives us the opportunity to reconstruct them if necessary. Small fragments of bone or articular cartilage can become loose within the knee joint often through trauma or degenerative changes (osteoarthritis). These can be removed and ‘washed out’ of the joint. An arthroscopy can assess the extent of damage that has occurred when a knee is injured eg. The smooth articular cartilage lining of the bone which allows smooth movement may be damaged when the knee is injured, this can result in a ‘divot’ of cartilage becoming loose and causing pain and locking of the joint. The cartilage surface may be treated in a number of ways, including microfracture…. If the joint lining is particularly inflamed, a small area of this lining can be taken (a biopsy) and sent for further investigations as to the cause. An arthroscopy can be used to remove /release scar tissue. For example, in very specific cases, a procedure called a lateral release can be performed. This is the surgical division of the soft tissues on the outer aspect of the patella. These structures can be extremely tight causing the patella to track in the wrong position. This tightness over a long time can place excess pressure on the under surface of the patella resulting in pain. The kneecap (patella) can be a source of pain in the knee. 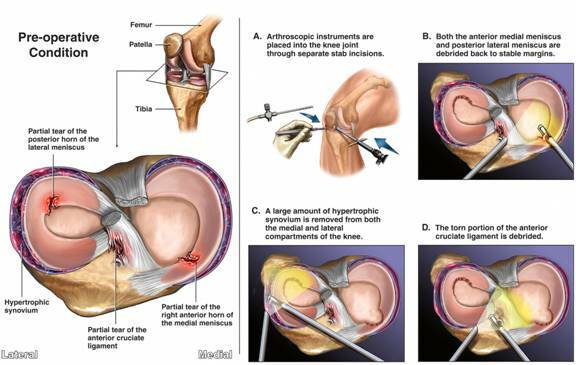 The arthroscope allows inspection of the patella under surface. If there is any loose articular cartilage this can be shaved. Most arthroscopies last between 20-60 minutes depending on what procedures are required. The procedure is usually performed under a general anaesthetic. Patients are admitted to hospital for day surgery but on some occasions may require an overnight stay. Once you are anaesthetised a tourniquet (a form of tight bandage) is placed around your thigh prior to the operation. This is inflated with gas throughout the procedure and minimises bleeding within the knee during the arthroscopy. The tourniquet rarely causes a problem, but may leave you with a “tight” feeling around the thigh for a day or two. Two to three small incisions are made at the front of the knee, one through which an arthroscope is inserted and another to insert the instruments required during the procedure. Normal Saline “salty fluid” is passed through the knee and this helps to inflate the knee and makes visualisation of the knee structures easier. A small puncture wound is made on the side of the knee to allow this fluid to escape from the joint. At the end of the operation, the fluid is drained from the knee. Local anaesthetic and morphine are injected into the knee to minimise discomfort after surgery. A relatively tight bandage is then applied. Stitches are required to close the wounds; these can be removed after 10 days. A tight bandage is applied after surgery, but is replaced by waterproof dressings before you go home. A double tubigrip bandage will be provided and should be used for at least 7 days. With modern anaesthetic techniques, most patients usually wake up relatively quickly and leave hospital the same day. We will give you instructions on how much weigh to put through your leg, and when to start physiotherapy. Your GP and physiotherapist will be sent a summary of the operation. You will normally be seen in the out-patient clinic 7-10 days after surgery in combination with my practice nurse. At this appointment, the bandages will be removed. The operation that was performed will be explained to you again as well as any follow up treatments that may be required. All operations have a small risk of complications. Thrombosis – Any lower limb surgery increases the risk of blood clots in the veins. The use of HRT and oral contraceptive pills may increase the risk of thrombosis and may need to be stopped before surgery. Mr Haddad will advise you on this. Infection – within the joint. Bleeding – This can sometimes occur after surgery and if severe may require a return to theatre for removal of blood and blood clots. Failure to improve – Despite a surgeon’s best efforts this procedure may not cure your symptoms. If this is the case other options of treatment will be discussed with you. Accidental damage to structures inside or near to the joint. This is extremely rare but there are occasionally symptoms from the small nerves around the knee. Remove outer wool and crepe bandages, leaving sticky plasters in place. These can be covered with tegaderm (waterproof clear dressings) which will be provided to you before your discharge from hospital. Tegaderm dressings allow showering, but not bathing. They should not be submerged. The wounds should be covered with Tegaderm dressings for at least 10 days. They can be removed if they start to peel off, and be replaced. Do not remove the plaster or the steri-strips underneath the tegaderm dressing unless absolutely necessary. If the dressing is peeling and you are not keen to take it off, then it may be best to reinforce it with a further dressing on top, and try to keep it as dry as possible. Ice and elevate the knee to reduce swelling. Always cover the ice with either a towel or pillowcase. You can “ice” for 15-20 minutes at a time during the day approximately every 1-2 hours. This helps to reduce pain and inflammation. Even if you are not in pain, it is best to take, at the very least, the anti-inflammatories (or the pain killers if you cannot tolerate the anti-inflammatories) for the first 5 days. Some patients find anti-inflammatories make then nauseous and give them a “stomach upset”. • Numbness, tingling, changes in the colour/ temperature of the operated leg. • Some patients find anti-inflammatories make them nauseous and give them a “stomach upset”.